· With the WinCT-AD4212D software, it is possible to display the weighing value and change the internal settings of the balance on your PC. ** For 0.1 mg readability. 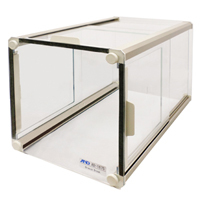 Stable measurement at 0.01 mg readability will also be possible when used with the AD-1675 tabletop breeze break. 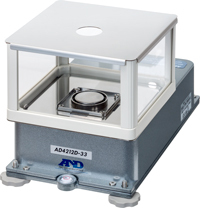 *** The AD-4212D has an IP65 rating when the cap is put on the pan support boss (after removing the weighing pan and pan support). *1 Smart range function: The display will switch to the standard range automatically when the value exceeds 5.1 g but return to the precision range when RE-ZERO (tare) is performed.